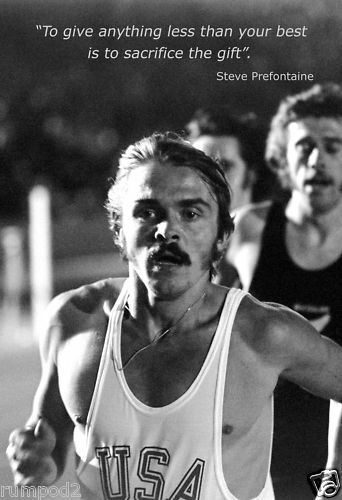 Clearly, I am no Prefontaine. Yet at mile 7 of this weekend’s Brooklyn Half, this quote was going through my mind. I was intentionally holding back, running 9:30s when my body was screaming to run sub 9. It felt silly, and strangely dishonest, I was holding back not to have something in the tank I was doing so because I have other dreams, dreams of finally breaking four hours at the Vermont City Marathon next weekend. So I followed the game plan. I held back fro the first ten as best I could average around a 9:35 mile, then I opened it up a bit for the last three. The rain started, Nas’s Get Down came up on my playlist, and I started running 8:30s. It was wonderful and strangely easy. This weekend, though, this weekend is going to be different. At Vermont City, I’ll be giving my best. All of it.